The winners, by only 3 minutes! 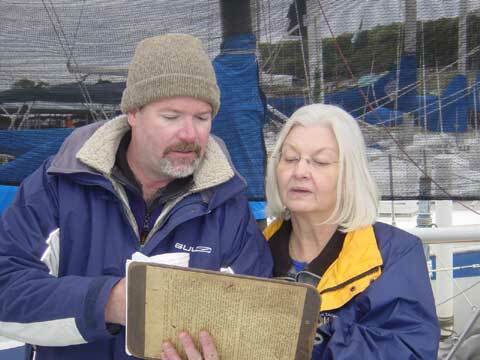 Melanie Beason (Cal 22) and Jim Brown (Hobie 17) had a great start. David Luckenbach (Flying Scot), with David Culp and Alison Pryce for crew, tried something dumb and crossed the line about last (that's me). The first leg was downwind, Melanie flew her spinnaker, Jim went fast, and both rounded Buoy E well ahead of me, Jim led the way. We flew ours too, and managed to pass the fleet to round Buoy E a distant third. We tacked up river, with more tree limbs to dodge than usual because Lake Stillhouse Hollow is down several feet. Melanie had a winch come apart, and sailed the rest of the race with one jib winch. About halfway to the bridge we passed her, and watched Jim disappear around a bend. We saw the dreaded Keel Monster this year! The lake was low enough that it was breaking the surface, it's an old concrete house foundation left in the lake. We gave it a wide berth, only to run aground anyway. Jim passed us heading back when we still had a long ways to go to the bridge, we rounded the buoy in 2nd with Jim out of sight. Melanie in third and Marty 4th in his Catalina 25. Marty did very well, he had three crew, I think the older two were 8 and 10 years old. The wind shifted a bit and we couldn't fly the spinnaker on the way back until we rounded the forest of dead trees. We thought we were well away, and hit a stump. Luckily the Scot rode up over it and slid off the other side, it missed the centerboard and rudder. Up with the spinnaker! Jim was in sight again, but miles ahead. The wind slacked off, so we ran a spinnaker broad reach nicely to Buoy E while Jim tacked upwind. We rounded Buoy E, and saw Melanie launch her spinnaker again, and so did Marty! 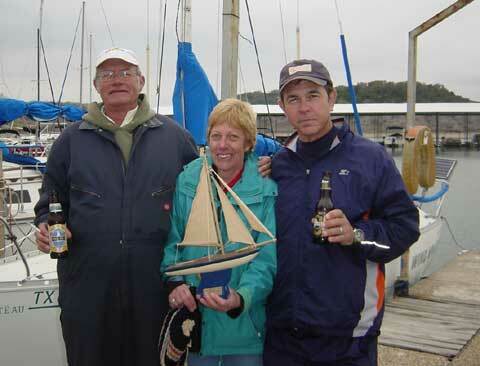 Jim took line honors in his Hobie, 45 minutes ahead of us, but we corrected over him and won first by 3 minutes. 3 minutes is not much for a 4 hour race! At around the 5 hour mark, Melanie finished 3rd, but Marty was not very far behind, and in a slower boat. We knew it was close, but corrected time showed Melanie ahead by only 3 seconds! Dave Klineman had to drop out with equipment failure, Mike Marshl's truck wouldn't start so he was late, but gamely started 1 hour 30 minutes late. If he finished, I believe that will put him in first place in the Texas Centerboard Circuit. 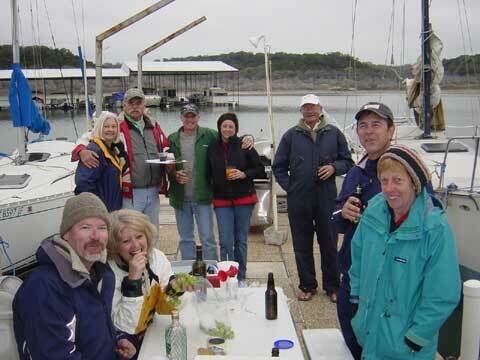 BBQ was enjoyed on the dock after the race! Jim Brown, 2nd place but line honors by 45 minutes ahead of David.